Obama has remained relatively silent as Trump dismantled his policies. What started with an executive order signed hours after Trump was sworn into office has become a signature of his presidency so far: undoing the policies of his predecessor. And perhaps that shouldn't come as a shock. During his historic presidential bid, Trump labeled President Barack Obama a "disaster," a "catastrophe," and "the most ignorant president in our history." In keeping with the norm of ex-presidents, President Obama has stayed relatively quiet as Trump has moved to dismantle his signature achievements in healthcare, foreign policy, and the economy. Here’s a look at some at some of those policies President Trump, with the help of a Republican controlled Congress, has managed to unravel after one year into his historic presidency. If we heard it once, we heard it a dozen times: On the campaign trail, Trump repeatedly pledged to repeal and replace Obamacare "on day one." But after intense, months-long debate, the Republican Congress failed to scrap the Affordable Care Act in its entirety, burning precious legislative time along the way. 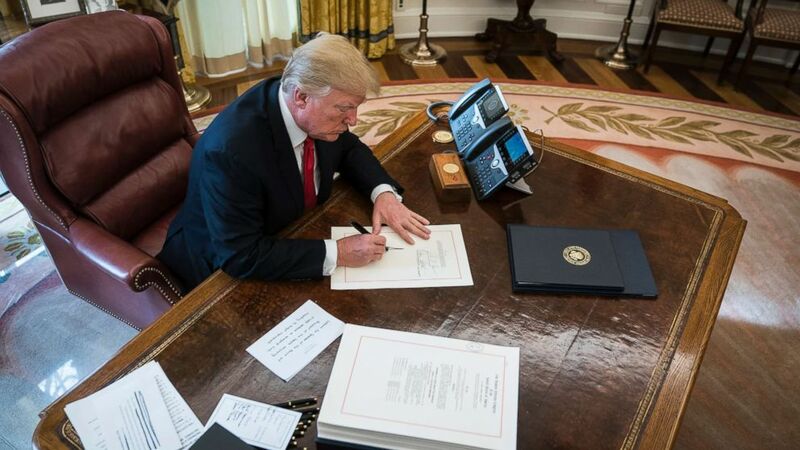 The president did manage by the end of the year to deal the law a devastating blow within the Tax Cuts and Jobs Act, which included a measure that did away with the so-called “individual mandate” that required Americans to have health insurance or face a tax penalty. That provision was critical to Obamacare and was designed to ensure that healthy people as well as sick ones paid into the system. (Jabin Botsford/The Washington Post via Getty Images) President Donald Trump signs the Tax Cut and Reform Bill, a $1.5 trillion tax overhaul package, into law in the Oval Office at the White House in Washington, D.C., Dec. 22, 2017. After signing the tax bill into law the president erroneously claimed it "essentially repealed Obamacare.” In fact, the healthcare law, however wounded, remains in place. Several popular provisions, like the prohibition against discriminating against pre-existing conditions and the medicare expansion, remain in effect. The president also used his executive power to end cost sharing-reduction payments, government payments under Obamacare that helped insurers offset the cost of providing healthcare to some of the poorest Americans. Congress says it’s working on a permanent fix to this problem, which threatens to raise premiums if nothing is done. Perhaps no other move by President Trump was more unexpected and controversial than his decision to yank the U.S. out of the Paris Climate Accord, a United Nations- sponsored deal that created a worldwide commitment to slow global warming. Under the terms of the agreement reached during the Obama administration, the U.S. made a large pledge to cut carbon emissions by more than a quarter. But Trump said the agreement put U.S. business at an economic disadvantage, and forecasted "lost jobs, lower wages, shuttered factories and vastly diminished economic production" if the country didn't pull out. Critics — who believe some conservatives' denial of rising global temperatures signaled a rejection of science — noted that businesses from Google to GE had urged Trump to stay the course, claiming the accord could actually spur job growth. But Trump plowed ahead, prompting applause from conservatives like House Speaker Paul Ryan, who called the accord a "raw deal," as well as backlash from liberals. 173 countries plus the European Union remain signatories to the climate agreement, and several U.S. mayors and governors have pledged to meet the stated reductions in carbon emissions despite the president’s decision to withdraw. Following three years of easing tensions with Cuba under President Obama, President Trump in June declared he was "cancelling the last administration's completely one-sided deal" with the Caribbean island nation. 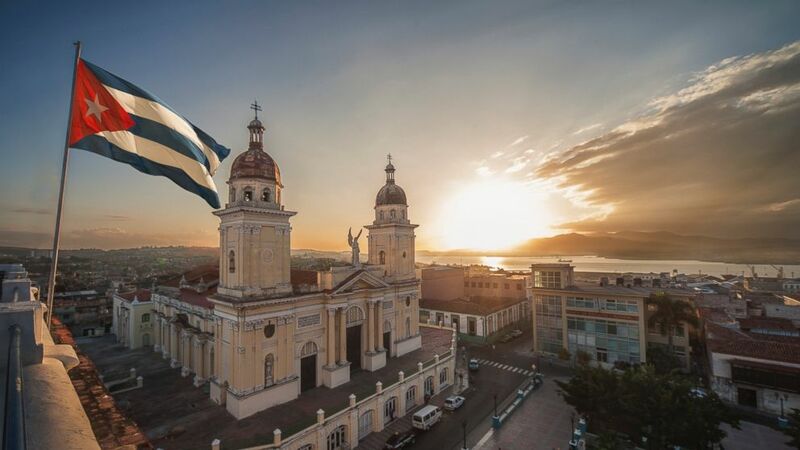 (Getty Images) A Cuban flag is pictured over Plaza de la Cathdral in Santiago de Cuba, Cuba in this undated stock photo. Five months later, the administration began implementing new restrictions, once again barring American tourists from traveling to Cuba via "people-to-people" exchange — a program that allowed U.S. citizens to travel to Cuba to experience culture without specific ties to companies or people there — and prohibiting American companies from doing business with entities tied to the Cuban military or intelligence service. In July, President Trump blindsided the Pentagon when he tweeted that the U.S. "will not accept or allow transgender individuals to serve in any capacity in the U.S. military," adding that the Defense Department "cannot be burdened with the tremendous medical costs and disruption" that come with trans people's service. President Trump's surprise tweet came just over a year after Obama's Defense Secretary, Ash Carter, officially lifted the ban in 2016. 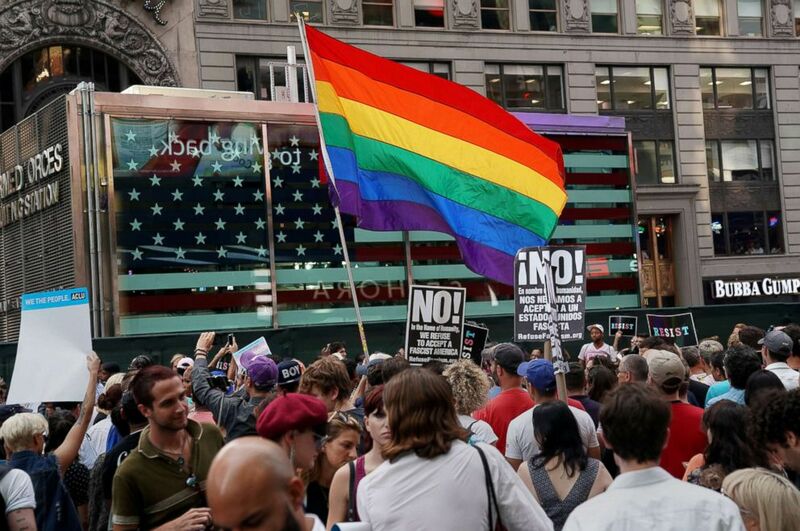 (Carlo Allegri/Reuters, FILE) A rainbow flag flies in Times Square, July 26, 2017, in New York, as people protest President Donald Trump's announcement that he plans to reinstate a ban on transgender individuals from serving in any capacity in the U.S. military. A month after the 140-character decree, Trump signed a memo formally directing the Pentagon to return to its pre-2016 policy by March 2018. "Further study" was needed, he said, to ensure transgender inclusion "would not hinder military effectiveness and lethality, disrupt unit cohesion, or tax military resources." But before it could take effect, a federal court put a stop to the impending ban, and effective Jan. 2, transgender individuals were allowed to enlist for the first time. Meanwhile, the Pentagon’s review about transgender policy is due March, and their future remains uncertain until then. On his very first day in office, Trump signed an executive order signaling his intent to withdraw from the Trans-Pacific Partnership, or TPP, a wide-ranging trade agreement aimed at encouraging trade between 12 countries on either side of the Pacific Ocean, like the U.S., Mexico, Japan, and Australia. The agreement, reached under Obama in October 2016, had yet to be ratified by Congress. Like many others, Trump believed the deal could undercut American workers, forced to compete with cheap labor overseas. But TPP isn’t the only trade deal Trump didn't like. He has also stated his desire to renegotiate the 1994 North American Free Trade Agreement (NAFTA) between the U.S., Mexico, and Canada — and if he can't strike a fair deal, he says he'll consider scrapping the pact. Trump believes NAFTA is unfair to the U.S. and sends jobs to Mexico. Others fear that without NAFTA, tariffs could surge and areas that depend on cross-border trade could fall into recession. Days after Obama helped broker an accord designed to reduce Iran's nuclear stockpile and lengthen the country's "breakout time" — the period it would take for Iran to obtain a functioning nuclear bomb — Trump decried the deal as "a direct national security threat." (Majid Asgaripour/AFP/Getty Images ) The reactor building at the Russian-built Bushehr nuclear power plant in southern Iran, Oct. 26, 2010. 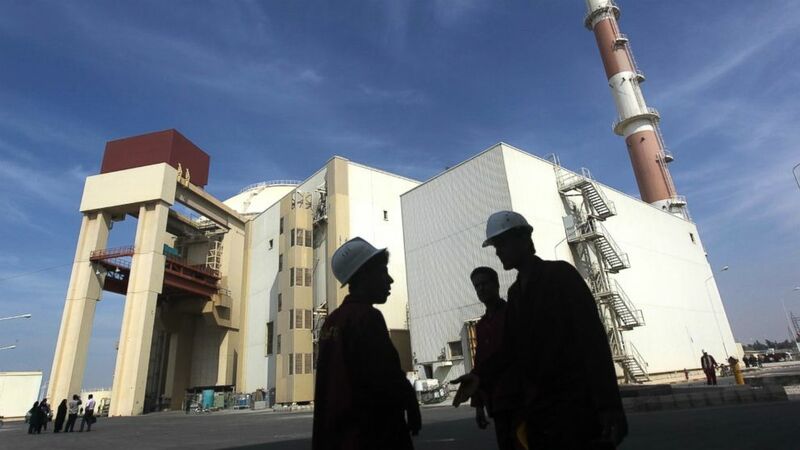 In return for the easing of economic sanctions, Iran had agreed to dismantle some of its nuclear systems and allow international inspectors into its facilities. Trump, who as president claimed Iran "continued to fuel conflict, terror, and turmoil through the Middle East," threatened to "terminate" the deal. He hasn't — yet. In January, Trump once again waved financial sanctions on Iran, keeping the deal intact — but he suggested the move represented a "last chance" to fix the deal's "terrible flaws" before he slaps sanctions back. He is proposing Congress come up with a fix to the deal, even though Congress had little do with reaching the deal in the first place, negotiated by Iran and six world powers. Iran Foreign Minister Mohammad Javad Zarif called the president's ultimatum "desperate" and insisted the deal was "not renegotiable." 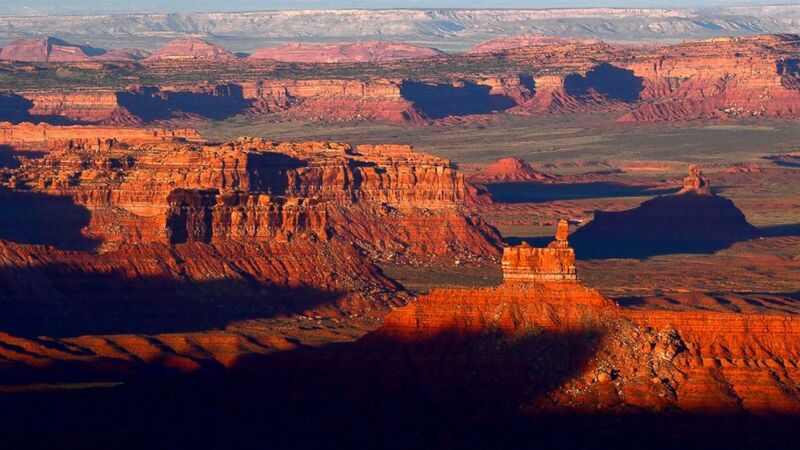 In December, over objections from several Native American groups, Trump drastically reduced the scale of several national monuments, including Bears Ears in Utah, designated by Obama just a year prior. (Katherine Frey/The Washington Post via Getty Images) The sun sets over Valley of the Gods in Bears Ears National Monument seen from the Moki Dugway June 11, 2017 north of Mexican Hat, Utah. The president billed the move as a victory for local communities, who he said should be allowed to decide how they want to use their land. Several local tribes and conservationist organizations sued the administration, arguing that the Antiquities Act, passed by Congress, gives the president the right to create monuments, but not reduce or remove them. 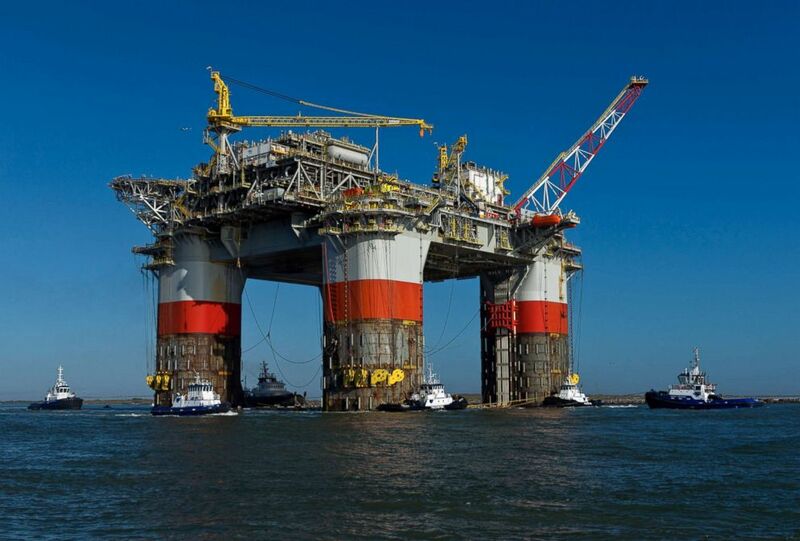 In early January, Trump moved to expand offshore drilling in U.S. coastal waters, effectively derailing Obama's five-year plan blocking Atlantic and Pacific drilling, finalized in 2016. Under the Obama administration, the only offshore drilling leases offered were in the Gulf of Mexico and the Cook Inlet of Alaska. Trump's plan opened up more than a billion acres in the Arctic, Pacific and Atlantic, starting in 2019. (Eddie Seal/Bloomberg via Getty Images, FILE) Tug boats transport the Chevron Corp. Jack St. Malo semi-submersible drilling and production platform to the Gulf of Mexico from Kiewit Offshore Services in Ingleside, Texas, Nov. 15, 2013. After an outcry from Florida Gov. Rick Scott, a Republican who insisted the state's national resources must be protected, the waters off Florida's coast were yanked from the plan. Immediately, governors from other coastal states like North Carolina, New York, Oregon, and Washington piled on, demanding their states be granted waivers as well. In December, the Trump administration quietly announce they would postpone a planned ban of three dangerous household solvents that the EPA says could be carcinogenic. Under Obama, the agency proposed their plan to ban the chemicals, TCE, NMP, and methylene chloride, just a day before Trump took office. The Trump White House later reclassified the proposed rule as "long term," delaying adoption indefinitely. 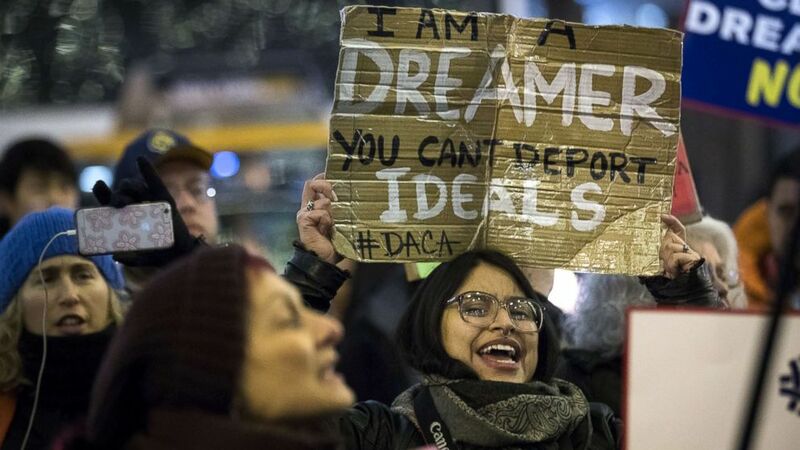 On September 17, 2017 President Trump announced he was rescinding the Deferred Action for Childhood Arrivals (DACA) program, an Obama-era policy that granted legal status to “Dreamers,” childhood immigrants who were brought to the U.S. illegally and by no choice of their own. Trump said the program would be phased by March, leaving the legal status in peril for 800,000 undocumented immigrants living in the United States. (Drew Angerer/Getty Images) Activists rally for the passage of a "clean" Dream Act, one without additional security or enforcement measures, outside the New York office of Sen. Chuck Schumer, Jan. 10, 2018, in New York City. The debate in Congress over providing protections for these individuals in exchange for Trump’s proposed border wall and other immigration measures has grown so intense it could threaten a government shutdown later this week. ABC News' Justin Fishel and the ABC News Politics team contributed reporting throughout the year.